The Detroit Metropolitan Airport’s Runway and Associated Taxiways Reconstruction project has received the Envision rating system’s Silver award from the Institute for Sustainable Infrastructure (ISI), which recognizes sustainable infrastructure across the full range of environmental, social and economic impacts. The airport is operated by the Wayne County Airport Authority (WCAA). This is the 19th project across the country to receive an Envision rating since the program began. The airport’s runway being reconstructed is 10,000 feet long and 150 feet wide. Typically, it is used for aircraft arrivals and can accommodate operations in low-visibility conditions, making it critical to the airport’s operational efficiency and business continuity. 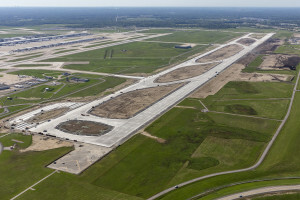 The project also involves reconstruction of the associated taxiway system, providing a safe connection for aircraft from the runway to the passenger terminals at the Detroit Metro Airport. In total, the project encompasses 6.5 miles of airfield pavement. The Airport Authority worked closely with its design and construction administration partners—RS&H, the prime consultant; and C&S Companies, who is also leading the sustainability efforts—to embrace holistic decision-making and resilient design. With the help of committed contractor teammates, including Ajax Paving Industries, Inc., and Dan’s Excavating, Inc., the design and its sustainability initiatives are being implemented effectively. By acting with sustainable infrastructure in mind, the Airport Authority is improving the long-term durability of the runway, reducing maintenance needs and costs, while increasing its operational efficiency. Created in 2012 through a collaboration between the ISI and the Zofnass Program for Sustainable Infrastructure at the Harvard University Graduate School of Design, Envision focuses on the impact of an infrastructure project as a whole. The ISI Envision system measures sustainability in five categories: Quality of Life, Leadership, Natural World, Resource Allocation, and Climate and Risk. These key areas contribute to the positive social, economic and environmental impacts on a community. The Runway and Taxiways Reconstruction project scored highest in the Leadership, Quality of Life, Resource Allocation and Natural World categories of Envision’s sustainable infrastructure rating system. Leadership (LD): The WCAA showed leadership in a number of ways throughout the project, including asking contractors in the bid packages for ideas on sustainability initiatives that could be implemented at Detroit Metro Airport or lessons learned from past projects. Quality of Life (QL): Besides creating more than 350 jobs, the Airport Authority and project team made concerted efforts to invest in the quality and diversity of the local workforce. As a federally funded project, the WCAA established goals for disadvantaged business participation during both the design and construction phases of the project. Resource Allocation (RA): A number of initiatives were implemented to reduce resource consumption, including the installation of LED lighting and signage, stormwater re-use for dust control (10,000,000+ gallons of recycled water, to date), and re-use of excavated materials both on the project and in locations west of the runway to balance the site and minimize maintenance needs. In addition, the contractor has brought a concrete crusher on site to enable efficient pulverizing of materials for use on other projects. Natural World (NW): The Runway and Taxiways Reconstruction project went beyond compliance with environmental regulations during construction by reducing existing impervious surfaces at the site, thus presenting long-term benefits to the ecological conditions on the airport. By minimizing the amount of pavement, stormwater runoff and the associated water quality impacts will decrease. This also minimizes future maintenance costs and the need for virgin materials. The Envision Silver award was presented by ISI at today’s Airport Authority Board Meeting. The runway and taxiways are expected to re-open and be operational later this year. Photos and additional details regarding the Runway and Taxiways Reconstruction project can be found HERE.